The city and the developer of the Menominee Nation Arena are working on a plan to limit environmental liability. The developer of the Menominee Nation Arena has fallen behind on property tax payments to the city amid continuing concerns about environmental problems at the site. The land underneath the facility remains in the hands of the city’s Redevelopment Agency, which has been unable to transfer the parcel to the developer because of the government’s newfound interest in a class of contaminants called per- and polyfluoroalkyl substances and known as PFAS. These substances are no longer manufactured in the United States and have not been found at the arena site. But they are believed to pose significant health risks. The problem for this project is that the U.S. Environmental Protection Agency has not yet developed guidelines for acceptable levels of exposure, and the Wisconsin Department of Natural Resources has suspended a liability program that covers reclaimed land such as what is found beneath the arena. Without liability coverage, the developer, Fox Valley Pro Basketball Inc., cannot take over the land from the city. Without ownership of both the land and the structures there, the developer apparently cannot obtain the most favorable financing terms. The city’s interest in the project is protected because the developer is not eligible for incentive payments if it is behind on taxes, Rohloff said. Greg Pierce, the president of Fox Valley Pro Basketball, did not respond to requests for comment. Under the terms of the development agreement, Pierce paid for infrastructure improvements in the area with the understanding that he would be reimbursed by the city returning part of his future tax payments. These payments are not available if the property owner is not current on his tax bills, which is why the city expects the issue to be resolved. The arena has an assessed value of $17.7 million. Its tax bill for the year is $438,719. One payment, for $108,629, was made Feb. 12, about two weeks late. A second payment, of $109,647, was due March 31 but was not made. City officials do not believe PFAS were used at the arena site, which had been a furniture factory and went through an expensive decontamination process. They hope to get a letter from the Department of Natural Resources that will limit the overall environmental liability for the owner of the site. The greatest concern about PFAS chemicals is groundwater contamination, which has been an issue in other parts of the state. But because the arena property, like most of the rest of the city, does not rely on groundwater, the danger from PFAS is considered lower in Oshkosh than elsewhere, Rohloff said. PFAS "are found in a wide range of consumer products that people use daily, such as cookware, pizza boxes and stain repellants," according to the EPA. The substances have been linked to cancer, high cholesterol and disruptions to the immune and hormone systems. Because PFAS and related chemicals were so widely used and do not break down easily, most people in industrialized countries have some amount of the substances in their bodies. Mayor-elect Lori Palmeri echoed Rohloff's comments about the city's incentive payments not being at risk. "Right now there’s no additional action by [the Common Council] that is needed," she said. 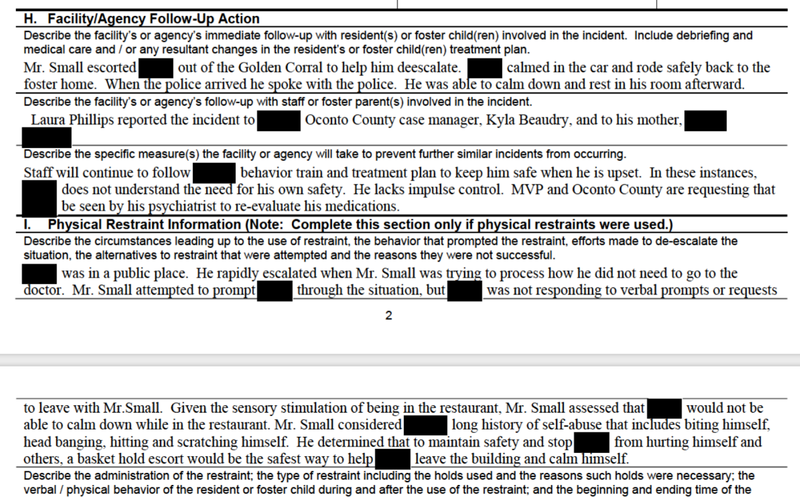 This is an excerpt from one of nearly 50 "serious incident reports" filed in connection with a local foster home. In the last five years, nearly 50 “serious incident reports” have been filed with the state in connection with the Oshkosh foster home that prosecutors say was the site of felony child neglect. The reports describe multiple instances of runaways, suicide threats, aggressive behavior, one account of sexual contact and some low-level criminal activity, such as disorderly conduct, shoplifting and apparently the possession of a small amount of marijuana by a foster child staying at the home. The residence is on 11th Avenue. But the operator of the home, Alan D. Small, believes that these reports, as well as the criminal charges against him, create a misleading impression because they do not reflect his record or the condition of the children who have been staying with him. It is not clear what happens with the serious incident reports once they are filed with the Wisconsin Department of Children and Families. A spokesman for the agency did not respond to a request for comment. Small has been working as a Level 4 foster parent since 2009, records show. To qualify he had to complete specialized training to prepare him for working with children with extreme behavioral issues, which may include physical aggression, sexual promiscuity and self-harm. According to DCF records, Small has been trained in trauma-informed care and nonviolent crisis intervention, including how to apply certain kinds of physical restraints that can keep aggressive behavior from spinning out of control. Small was charged Feb. 27 with three counts of felony child neglect after police were told of living conditions that included a lack of access to the bathroom and alarms on bedroom doors. Small’s point about dealing with youth who could not be taken in elsewhere is borne out by some of the incident reports. In a 2017 case, Oshkosh police became involved when a student from the Small home showed up at South Park Middle School with bite marks. The student was from Washington County. When the social worker from that county was alerted to the situation, the case was “screened out,” meaning that no further action was deemed necessary, according to state records. But the police officer assigned to South Park wanted to know why so many of the children sent to Oshkosh are from other parts of the state. The officer contacted Laura Phillips, clinical director at Macht Village Programs, a foster child referral company in De Pere that oversees the Small home. Phillips explained that the Oshkosh foster home was used because it had been rated at Level 4, meaning it could take in children with severe behavioral problems. “Foster homes that can adequately support children with intense needs are a scarce resource,” Phillips said, according to a report she filed with the state about the incident. Other residents at the Oshkosh foster home over the last five years have come from Brown, Kenosha and Oconto counties, according to state records. In a January 2014 incident that began at the Gem Roller Rink in Appleton, police were called when a 10-year-old foster child became upset and ran outside into the below-zero night without a coat or hat. The boy was apparently outdoors for more than an hour and was taken by police to St. Elizabeth’s. Police said he was “banging his head, kneeing himself in the face, biting himself, running around the hospital, screaming, swearing, demanding to go to jail,” according to a DCF incident report. Eventually the situation was resolved with the boy returning to the Small foster home. Small denied the accusation that children in his care used “toilet buckets” as described in the criminal complaint against him. “There were commodes … with handles and toilet seats,” he said. He acknowledged that feces were dumped in the yard but described that as a lapse in judgment by his mother, Barbara R. Peterson, who assists him in running the foster home. Peterson, who has also been charged with child neglect, did not respond to a request for comment. Small and Peterson are currently free on $1,000 signature bonds and due back in court April 8. Small acknowledged that foster children in his care have been confined to their rooms, which are equipped with alarms, but he said this was a safety precaution. The two boys who triggered the police investigation had previously run away from the home, and one had attempted sexual contact with the other, according to state reports. After an August runaway incident, the Macht company required Small to “install door and window alarms throughout the home,” according to state records. “If I wasn’t doing that, then I could see them charging me with neglect,” Small said. He added that all of the “serious incidents,” which are defined by state rules, that have occurred at the house have been documented and reviewed by a social worker.